The installation process was very straightforward with the NZXT H700i. For the purposes of demonstration, I built it with some spare parts kicking around. Out of preference, I installed my Intel Desktop Board DZ77GA-70K motherboard first, followed by the rest of my components. Since the interior of the H700i is separated into two chambers, it does not matter whether you install the PSU or motherboard first, since they will all work out just as well in the end. Pushing all the case I/O cables through one of the two openings close to the motherboard on the panel separating the two chambers delivered excellent accessibility to anything that requires a connection to my motherboard. An opening near the outside edge of power supply chamber ceiling allows easy power delivery to your graphics card. Furthermore, almost the entire area behind the red strap is an opening to connect what you need to your motherboard, which is very well designed. It is also very effective at hiding cables. In general, everything was appropriately placed for routing cables through, whether they are from your power supply, case, or storage devices. The large motherboard tray cutout also made the installation of any aftermarket CPU coolers totally painless. A small complaint is the paint on the red strap is easy to scratch if you are not careful, kind of like the paint on your car. When building your PC, be sure to keep sharp components away from this area. Some touch up paint included out of the box would have been nice. Executing a good cabling job was pretty straightforward on this ATX mid-tower. Unlike some cases with tempered glass side panels I have used in the past, the H700i has only one tempered glass panel, so you do not need to worry too much about how things work out behind the motherboard tray. That said, NZXT has an excellent cable management section here, as shown in our photo above. Therefore, organizing the modular cables from my SilverStone Strider Titanium ST1300-TI 1300W power supply was a breeze. My only suggestion is to increase the room between the motherboard tray and side panel for better cable fitment. Installing the PSU required the removal of a bracket at the back, which was attached to the case by four captive thumbscrews. There are tons of cable routing guides and well-placed tie down points to keep everything in good order. The rest of the installation process came and went just as smoothly as I continued to install the rest of my components like my SSD and HDD. The SSD shown in the photo is the Toshiba OCZ TR200 480GB installed behind the motherboard tray. Also shown in the above photo is the Seagate BarraCuda Pro ST12000DM0007 12TB. Unless you count thumbscrews as tool-free, installation of most components will require you to keep your screwdriver handy. Stuff like storage drives will require a screwdriver. I do not have much beef against this though, since it is usually much more secure, and it is not like I will take my computer apart occasionally anyway. The great thing about the NZXT H700i is, apart from the motherboard tray SSD brackets, everything has captive thumbscrews for added convenience. The CAM Powered Smart Device controller module, which controls all the lighting and fans inside the NZXT H700i, require you to install NZXT's CAM software to operate. CAM is NZXT's PC monitoring and controller program. 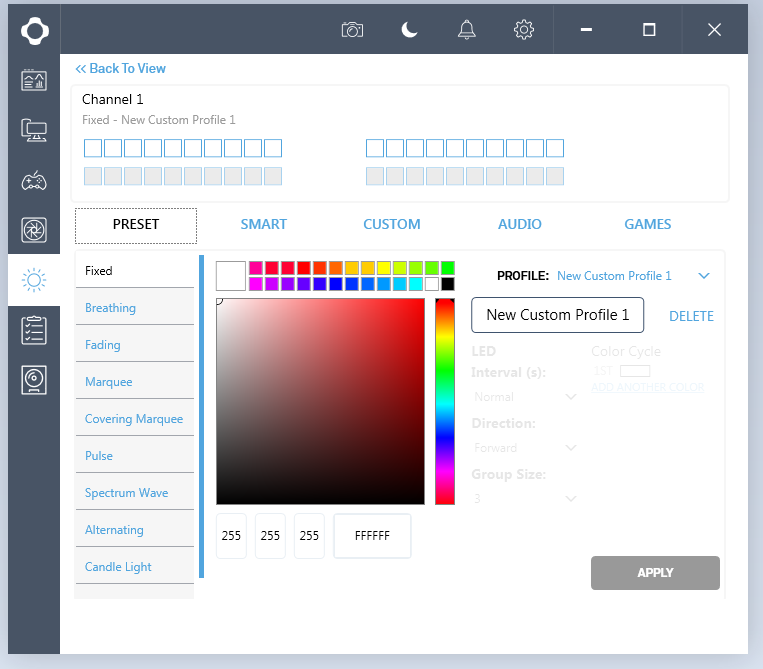 In the latest version, I found it to be clean and intuitive to use, whether it is configuring the color output of the RGB LED strips or setting up fan profiles. The only thing I do not like is the way calibration is implemented. You have to perform specific tasks and meet certain conditions in order for the calibration process to progress through the steps, which can be frustrating at times. In my opinion, a self-calibration procedure should be implemented. I understand the interactive calibration procedure may produce more accurate cooling profiles, but I am not convinced it will be considerably better than a well-designed self-calibration algorithm. My colleague Aaron Lai has used and discussed CAM in several past product reviews, including the CRYORIG H7 Quad Lumi and NZXT HUE+. After plugging in everything, our system configured inside the NZXT H700i was ready to roll. I hit the large circular power button at the top, and my computer came to life. With some LED lights inside, the tempered glass makes a stunning show out of your interior components. On a scale from 0.0 to 10.0 where 0.0 is silent and 10.0 is the loudest, the stock NZXT Aer fans would come in at 4.5 subjective sound rating at maximum speed. This is very good. Slowing them down will keep it at around 1.5 in my personal opinion. I am quite sensitive to perceived sound volume, and as a quiet PC enthusiast, the NZXT H700i is quite impressive, considering there are no noise insulation material installed. The fans have a smooth running motor with no annoying noise during operation. I do not think this case was designed specifically for quiet PC enthusiasts in mind, but it is not a bad choice if you are looking for a great looking case with quality stock fans especially after calibration. The straight unrestricted airflow design is excellent for enhanced cooling performance. Some people say beauty is only skin deep. Is this true about the NZXT H700i? Our premium matte black and red mid-tower is, no doubt, stunning to look at and beautiful to behold. But its beauty is not limited to what that meets the eye. Put your hand on the NZXT H700i, and you will literally feel a quality chassis constructed out of quality materials. As we pull the tinted tempered glass side panel off, the interior is equally as beautiful, featuring a layout that is both functional and easy to work with. In between the details, we see a collection of NZXT's excellent Aer F series fans pre-installed out of the box; all placed in areas with appropriate filters to ensure cool air will pass through at the same time dust will not. With excellent cable routing options and the liberal use of captive thumbscrews, NZXT's H700i is not skin deep -- it is beautiful inside and out. Simply put, the NZXT H700i is a piece of art not only in aesthetics, but also in design. There is only a small handful of things I would like to see improved on this mid-tower chassis. Firstly, the room behind the motherboard tray for routing cables can be tight. Increasing the gap here can make routing cables easier. Secondly, the interior metal strap's red paint can be easily scratched. A change of material or painting process can reduce this risk. Lastly, adding a self-calibration option for CAM will make creation of custom fan speed profiles a lot easier. To wrap it all up though, I must say the NZXT H700i's excellence is unquestioned. This is a case where its presence simply has nothing to prove. NZXT provided this product to APH Networks for the purpose of evaluation. The NZXT H700i is a stunning looking mid-tower chassis that is easy to work with and thoughtfully designed inside and out. Do you have any comments or questions about the NZXT H700i? Drop by our Forums. Registration is free, and it only takes a minute!